FortiMail Virtual Appliances deliver proven, powerful messaging security within virtual or cloud infrastructures for any size organization or service provider. Purpose-built for the most demanding messaging systems, the FortiMail-VM utilizes Fortinet's years of experience in protecting networks against spam, malware, and other message-borne threats. The FortiMail family of appliances is a proven, powerful messaging security platform for any size organization, from small businesses to carriers, service providers, and large enterprises. Purpose-built for the most demanding messaging systems, the FortiMail appliances utilize Fortinet’s years of experience in protecting networks against spam, malware, and other message-borne threats. FortiMail prevents your messaging systems from becoming threat delivery systems. Its inbound filtering engine blocks spam and malware before it can clog your network and affect users. Its outbound inspection technology prevents other antispam gateways from blacklisting your users by blocking outbound spam and malware, including mobile traffic. FortiMail dynamic and static user-blocking gives you granular control over all of your email policies and users. Enforce secure content delivery with FortiMail Identity-Based Encryption (IBE), S/MIME, or TLS email encryption options. Prevent accidental and intentional loss of confidential data using FortiMail predefined or customized dictionaries. FortiMail appliances provide high-performance email routing and security by utilizing multiple high-accuracy antispam filters. When coupled with industry leading real-time antivirus and antispyware protection from FortiGuard Services, FortiMail provides you with extremely fast and accurate messaging security that won't affect end users or delay their communications. Deploy messaging security in the mode that best suits your environment and users with FortiMail's unmatched flexibility. Deploy appliances or virtual appliances in Transparent, Gateway, or Server modes All email servers on the market deploy in Server mode, some offering a Gateway mode option. 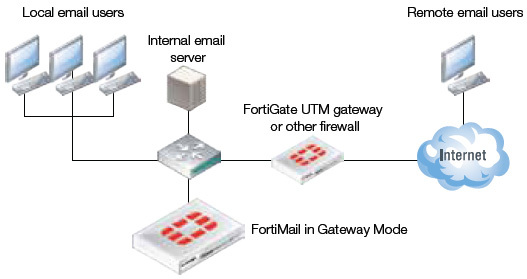 Fortinet is the only vendor to offer Transparent mode, enabling FortiMail to intercept emails without changing DNS MX records, or existing email server network configurations. Apply Identity-Based Encryption in both push and pull methods Ensures secure delivery of confidential or regulated content. Extremely easy to deploy – no additional hardware or software to install, no user provisioning, no pre-enrollment for recipient. Data Loss Prevention and Compliance Detect accidental or intentional loss of confidential or regulated data. Achieve PCIDSS or HIPAA compliance by blocking messages containing defined data patterns, or creating policies to enforce encryption of certain emails. Identify and Block Spamming Endpoints Prevent blacklisting of legitimate subscribers by identifying and blocking endpoints sending spam, including Smart phones. Ideal for Carriers and Service Providers. No per-user or per-mailbox pricing Complete, multi-layered antivirus, antispam, antispyware and anti-phishing protection for an unlimited number of users. Greatly reduces TCO. Gateway Mode: Provides inbound and outbound proxy mail transfer agent (MTA) services for existing email gateways. A simple DNS MX record change redirects email to FortiMail for antispam and antivirus scanning. 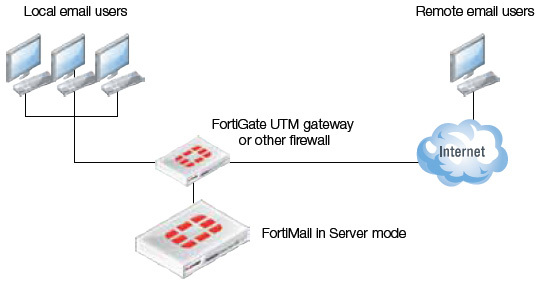 The FortiMail device receives messages, scans for viruses and spam, then relays email to its destination email server for delivery. Transparent Mode: Each network interface includes a proxy that receives and relays email. Each proxy can intercept SMTP sessions even though the destination IP address is not the FortiMail appliance. FortiMail scans for viruses and spam, then transmits email to the destination email server for delivery. This eliminates the need to change the DNS MX record, or to change the existing email server network configuration. Server Mode: The FortiMail device acts as a stand-alone messaging server with full SMTP email server functionality, including flexible support for secure POP3, IMAP and WebMail access. FortiMail scans email for viruses and spam before delivery. As in Server mode, external MTAs connect to FortiMail, allowing it to function as a protected server. IBE allows FortiMail to deliver confidential and regulated email securely – without requiring additional hardware, software user provisioning, or extra license fees. Use IBE to eliminate paper-based communications and reduce costs. Policy-Based Encryption: Automatically encrypt messages for compliance, based on content or recipient. Push or Pull Mode: Use Push, Pull, or a combination of modes to meet your requirements. Easy to Deploy, Use, and Manage: Deploy IBE in any mode, including Transparent mode, without user provisioning or additional hardware or software. FortiGuard Security Subscription Services deliver dynamic, automated updates for Fortinet products. The Fortinet Global Security Research Team creates these updates to ensure up-to-date protection against sophisticated threats. Subscriptions include antivirus, intrusion prevention, web filtering, antispam, vulnerability and compliance management, application control, and database security services. FortiCare Support Services provide global support for all Fortinet products and services. FortiCare support enables your Fortinet products to perform optimally. Support plans start with 8x5 Enhanced Support with "return and replace" hardware replacement or 24x7 Comprehensive Support with advanced replacement. Options include Premium Support, Premium RMA, and Professional Services. All hardware products include a 1-year limited hardware warranty and 90-day limited software warranty. Download the Fortinet FortiMail Datasheet (PDF). FortiCare/FortiGuard Continuous Service Policy: Fortinet designed FortiCare support and FortiGuard subscriptions to be continuous. When a customer does not renew by the expiration date, then a lapse in the service period occurs. Lapses in service will now require coverage back to contract expiration date in order to maintain continuous service coverage. The maximum back coverage is limited to six months. In other words, if the coverage has lapsed for more than six months, then out of a one-year renewal contract, six months will be used to cover the lapse in service and then the remaining service time will be used to provide continuing service. The difference between the new start date and end date will not be greater than the service period purchased. All Hardware pricing includes 365 days Support coverage for Hardware, and 90 days for Firmware Updates & Email/Web Technical Assistance.